You will have seen the gorgeous Picnic Hamper I received earlier this month from Interflora. Well now is your chance to win one of your own. The hamper you will win is a "classic picnic hamper, complete with cutlery and plates for four. It's already filled for that first picnic, with a lavish selection of fine crackers and cheese, dips and preserves, as well as a rich date and walnut cake and a superb bottle of Viognier", so how can you resist? Interflora sell a wide range of gifts including a large selection of Hampers, Flower Gifts and also Romantic Gifts, if you are looking for something for your loved one. To win a Luxury Hamper from Interflora just leave me a comment. 4. Like the Interflora Facebook Page and leave a separate comment to let me know you have done so. 5. Follow Interflora on twitter and leave a separate comment to let me know you have done so. The giveaway is open to UK residents only and runs until Saturday 27 August 2011. Wee note: I have been having difficulties with blogger this week and my sidebar isn't always loading fully in firefox. This is a problem if you want to view my index or add yourself as a follower. If you have the same problem, try opening the page with internet explorer which seems to be fine. What is it about picnic hampers that is so evocative of days past. Maybe it's that I used to play picnics with my dolls when I was little and the unpacking of all the crockery and cutlery and eating of miniature food took me hours, although I was very naughty and never used to wash my sticky dolly pots, cue lots of tellings off from my Mum who didn't have time for mini washing up as well as normal sized stuff. Now I'm all grown up picnics have reverted to tupperware boxes and plastic flasks....it's just not the same is it!! I thought I was already following you on Twitter - STALKER - but I wasn't, so that's been rectified. The hamper looks fab. If only there were more opportunities to picnic outside here in sunny (not) Scotland. However, I'm sure an indoors picnic could be just as fun ! Already your follower. Would love the hamper. I am already a follower as you may or may not know! Great give away! I "liked" interflora on FB! Can I enter for my friend who lives in London? wow looks great, please include me! What a great competition, I didn't even know that Interflora did hampers!! I follow interflora on twitter already! I also follow then on facebooK! Oh and I was also having problems with blogger comments on my blog. I added disqus and it is sooo much better! 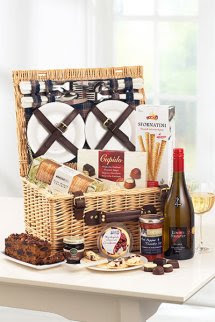 Jac, you are giving us some fantastic prizes - a picnic hamper always sounds so grand. already follow your blog. don't do twitter. it's taken me long enough to get the hang of facebook and blogging. liking interflora on facebook too. That is a gorgeous hamper I feel they are the height of luxury, I remeber going to the beach on our honeymoon with a plastic tub of sarnies and a flask of tea and seeing two very weel to do people just married with their hamper of strawberries and champers. till I and hubby were blisfully happy and still are the sarnies and flask still are magical. I already follow youe blog - and love it! Picnic hamper - creates lovely thoughts of summer meadows, buzzing bees and lying hidden amongst the grasses staring up at an azure sky - if only! already a follower of tt! What a pretty little hamper! Wonderful giveaway---and a bottle of voignier?! My favorite! Nothing beats a picnic, and they taste so much better from a proper picnic hamper! I just wish the weather had been better this summer to have more picnics! Oooh I would love to win a super scrummy hamper! A picnic hamper is something I've always longed to own, but have never been able to justify buying. Excellent competition. I have followed your blog via GFC. I like Interflora on Facebook. Looks amazing, feeling very hungry now! 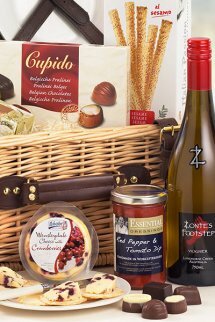 Love to win the hamper!